After a decline earlier in the decade, homelessness in Minnesota has jumped by 10 percent since 2015, according to a new study by the St. Paul-based Wilder Foundation. Wilder Research counted 10,233 people, on a single day — Oct. 25 — who were in emergency shelters, domestic violence shelters, and transitional housing programs, as well as people camped outside or who sought services at hot-meal programs and other drop-in sites. That's a jump of nearly 1,000 people since the last study in 2015, and marks the highest count since the study began in 1991. Even so, the study's authors say the count underestimates the number of people in Minnesota who are homeless. The tally misses many homeless people who are not staying in a shelter the day of the study, especially young people and people living in rural areas. The results stand in stark contrast to the labor market. Total employment grew during the same time period, with unemployment at a historically low rate of 4 percent or less for most of that time. The jobless rate was a mere 2.8 percent the month of the survey. The study documented a significant rise in the number of people experiencing homelessness who were not in a formal shelter. Their numbers ballooned by more than 60 percent since 2015, essentially because shelters are out of room. "The population of people staying in shelters is similar to what we saw in 2015, due in part to shelters being at full capacity." said Michelle Decker Gerrard, the study's co-director. 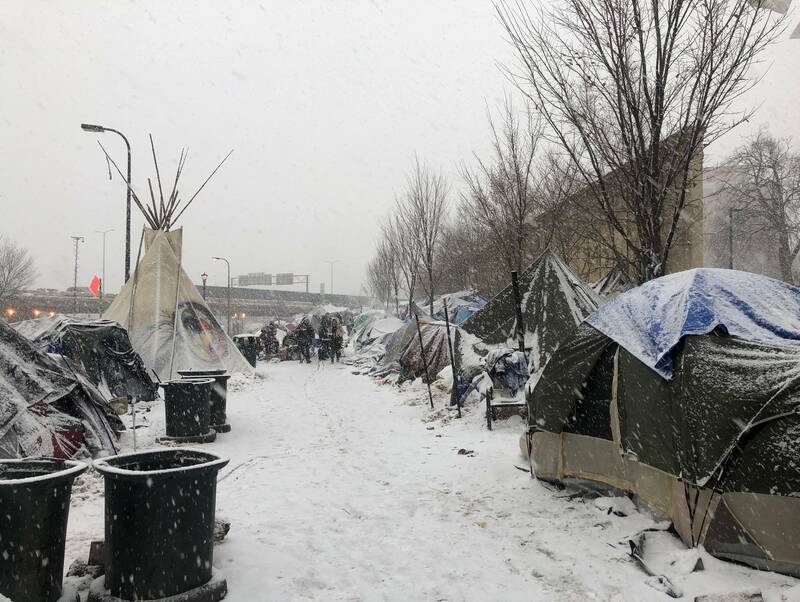 People interviewed in outreach locations said they stayed in a variety of places during the month of the study, sleeping in encampments, cars, or on public transportation. Others couch hopped or stayed with others. "We're concerned about the growing number of people who are staying outside or temporarily doubling up," Decker Gerrard said. Adults ages 55 and over saw the sharpest rise in homelessness since 2015. Their numbers grew 25 percent. There was a small piece of good news in the study. Families experiencing homelessness dropped by 5 percent, to just under 1,500. The number of homeless children with their parents, and youth 24 years old and younger, remained about the same. Children and unaccompanied youth make up nearly half of the state's homeless population.